Opening with a silent “movie” of Butch Cassidy’s Hole in the Wall Gang, George Roy Hill’s comically elegiac Western chronicles the mostly true tale of the outlaws’ last months. 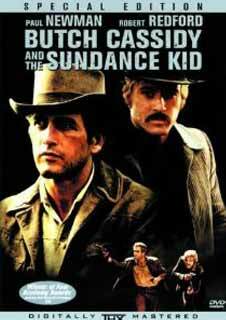 Witty pals Butch (Paul Newman) and Sundance (Robert Redford) join the Gang in successfully robbing yet another train with their trademark non-lethal style. After the pair rests at the home of Sundance’s schoolmarm girlfriend, Etta (Katharine Ross), the Gang robs the same train, but this time, the railroad boss has hired the best trackers in the business to foil the crime. After being tailed over rocks and a river gorge by guys that they can barely identify save for a white hat, Butch and Sundance decide that maybe it’s time to try their luck in Bolivia. Taking Etta with them, they live high on ill-gotten Bolivian gains, but Etta leaves after their white-hatted nemesis portentously arrives. Their luck running out, Butch and Sundance are soon holed up in a barn surrounded by scores of Bolivian soldiers who are waiting for the pair to make one last run for it.